""Remember the tune they were singing the night we fell in love?..."" 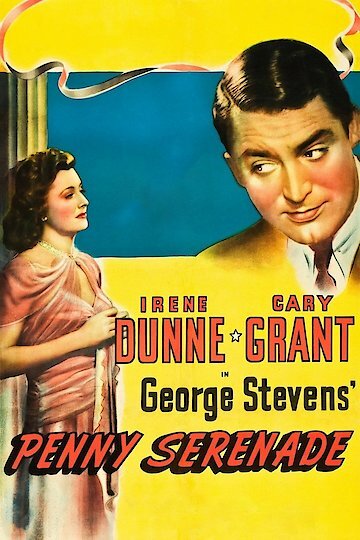 Starring Cary Grant and Irene Dunne, "Penny Serenade" is a classic melodrama that tells of the joyful and often saddening times that young couple Roger and Julie Adams experience in their early years of married life. However, times have recently been extremely difficult and painful and as a result, Julie is planning to leave Roger. The story of their life together is told through Julie's perspective as she is reminiscing the events of their life and playing an old record, "You Were Meant For Me". Julie recalls first meeting Roger and eventually marrying him. She recalls events both tragic and difficult in their early life together including their financial struggles and inability to conceive a child. Filled with not only unexpected sad twists, the film boasts many spontaneous joyful moments between the couple. Penny Serenade is currently available to watch free on Tubi TV, The Roku Channel and stream, download, buy on demand at Amazon Prime, FlixFling, EPIX, FlixFling VOD, Amazon, Vudu online.